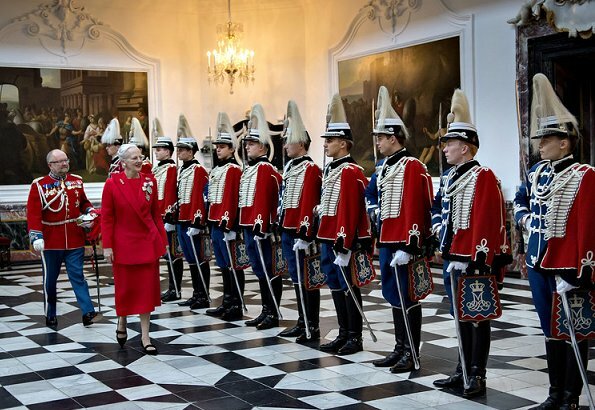 Queen Margrethe of Denmark received new ambassadors of Finland, India, Burkina Faso, Turkey and Germany, who are appointed for Denmark, at Fredensborg Palace. The Queen published an accreditation for new ambassadors of Finland, India, Burkina Faso, Turkey and Germany. The ambassadors can work in Denmark after their identity documents are presented to the Queen. The Queen looks beautiful in this colour. Very elegant. Looks like the cast of an operetta. I like the red of the Queen's outfit and of course I love the tralala - otherwise no reason to look at this side. Some call it operetta others tradition.